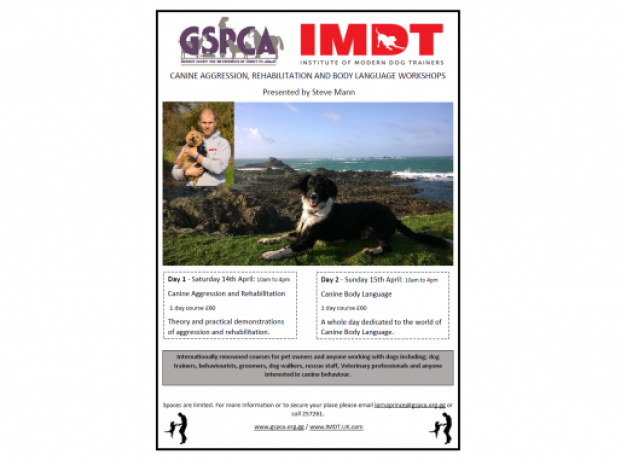 Steve Mann, internationally renowned trainer from the Institute of Modern Dog Trainers, is visiting Guernsey in April to run weekend work shops on Aggression, Rehabilitation and Behaviour/Body Language at the GSPCA. These courses are aimed at anyone that works with or owns dogs or simply has an interest in canine behaviour and training. This is an amazing learning opportunity for those who need to learn about or update their canine behaviour and training skills. Earlier this year GSPCA staff Seb Goman and Teresa Mourant spent over 6 weeks volunteering to train to complete their Level 1 as a Puppy Assistant at the Animal Shelter. As the Slovakian puppies head out into their new and loving homes it will be important to set them off on the best paw forward. This morning another group of the Slovakian puppies with friends and owners came along to the first of a six week training course with Welfare Manager Lorna Prince. It is extremely important to ensure all puppies are well socialised and trained for happy owners and happy puppies. At the GSPCA we have a team of volunteers that run dog training classes. Last night was the last of the Graduate Dog Training Group and all the dogs did really well and passed with flying colours.